After the level running and brief excitement of the town, you are soon upon the longest climb of the route. Hang in there, the gradient does ease gradually and at Bovingdon Green you have a mile or so of easier running. Enjoy while you can. Are you ready? 3 big dippers in the less than two miles: hold on tight! Number one: 80ft straight down and 130ft straight back up again. Do not lose heart, this is the steepest climb, though certainly not the last. A brief respite, some level running leading to gradual descending, before launching you into your second big dipper. The climb out is a slightly kinder 90 ft, although your already tired legs won’t thank you much! Bockmer End and you turn the corner back towards Marlow. You have conquered half the miles and three quarters of the climb. The final drama awaiting you is the third big dipper 150ft down and straight back up, until you find Marlow Common again and you have ran full circle. Your legs will now reawaken to the fabulous two mile descent to the finish, you can put all the hard work behind you as you enjoy the elation of completing this short but tough race. Congratulations: You have beaten the Marlow 7. 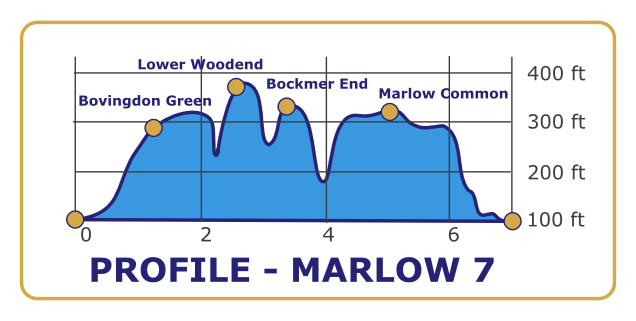 Perhaps the little brother of the Half Marathon, but make no mistake, the Marlow 7 inherits its character: Tough!